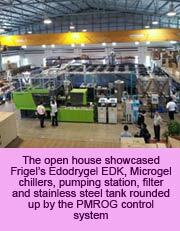 Process cooling equipment supplier Frigel Asia Pacific expects sales for its adiabatic Ecodry system to soar. In anticipation of this, Thailand-based Frigel Asia is setting up a new facility in Bangpakong (in the Free Trade industrial zone). Currently operating from a 1,000 sq m facility in the vicinity, the firm will move to a larger 8,000 sq m plant by next September, said Benjamin Sutch, President Service and Sales Asia. “We are investing US$3 million in this plant,” he added. The Ecodry system is aimed at replacing cooling towers. It operates as a closed system and uses air-heat exchange as the method of heat rejection as opposed to the open system-cooling tower that uses water evaporation as a method of heat rejection. During the presentation, Per Skjevik, Sales Director, provided some impressive comparisons. While a cooling tower with a 450-tonne cooling capacity evaporates 32,000 cu m/year of water; the Ecodry does the same using only 326 cu m/year of water, which is 1% of a cooling tower. He also explained that ambient air passes through the patented adiabatic chamber before reaching the finned coils; wetted air drops the temperature to a value required to keep the process water's temperature below the maximum set point, and a microprocessor controls the variable-speed fan motors and the amount of water sprayed to keep the value constant. “Excess moisture is accumulated in the Ecodry system's evaporative filters and the finned coils remain dry and clean. The system is self-draining and can operate with or without the use of glycol,” said Per. 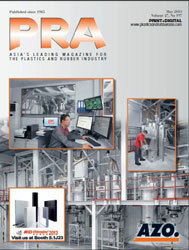 The system is targeted at facilities operating injection moulding and blow moulding machines. Per also provided an account of a client in Thailand that reduced its energy bill by 8 million baht a year and paid off the cost of the Ecodry over two years. And while the Frigel officials agree that cooling towers are low priced and simple, they add that the disadvantages outnumber the benefits. These include: calcium/solid build up in pipes and the heating elements; algae/bacteria growth; continuous maintenance; big temperature variations; high energy/water use, and a larger contamination risk of Legionella bacteria, the cause of legionnaires disease. Frigel, established by the Dorian family in Florence, Italy, in 1960, set up an exclusive distributorship in Thailand two years ago, with ex-Husky Injection Molding senior executive Marcus Sutch and his son Benjamin Sutch. 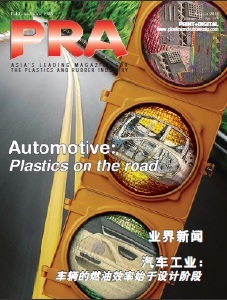 Frigel Asia Pacific’s target markets are Australia and Japan, accounting for a third of sales each, in sectors other than plastics (food/beverage processing and hospitals) since it can also be used in HVAC/air conditioning systems, according to Marcus. Globally, Frigel has about 5,500 Ecodry installations in more than 20 countries and operates three manufacturing sites in Thailand, Italy and the US. It will have a turnover of EUR40 million this year.